A good slip-on shoe for women should be comfortable, have a good grip, fit well, and be easy to get on and off. Slip-on shoes are perfect for traveling, walking or doing errands. They also work well as a closed toe alternate for the summer, since you can wear them with or without socks. Whether you love the ease and convenience of a slip-on, or you hate bending over to tie shoestrings, we have found 12 of the best styles for women. The Vans Classic Slip-on has been around forever and has become a classic in its own right. This style has a little bit of arch support, along with a padded footbed to help with comfort. They are a good, casual shoe if you want to put on a shoe that is comfortable that you can wear out and about. It is primarily made of canvas, and the simple styling means that you can wear them with almost anything. They feel very durable and well made, so you should be able to get many years wear out of them. The sole and the overall structure of the shoe are a little bit hard, so if you are prone to blisters, this may not be a good style for you. Sanuk are well known for their super comfortable footwear, they offer a few different easy on and off shoes for women, with the Fiona Flat being one of their most popular. This casual shoe is vegan-friendly, has a frayed edging and an animal print lining. Since they are a light canvas, they should stretch out a little bit the more you wear them. The Fiona has something called a high-rebound footbed that is the key to the comfortable feel of this design. It is also manufactured with an Aegis antimicrobial treatment, which should help with odor, especially if you are wearing the shoes without socks. The Fiona is cute and comfortable and will go with most relaxed summer looks. One of the best things about this style is that you don’t need to break them in, they are comfortable from the first time that you put them on. 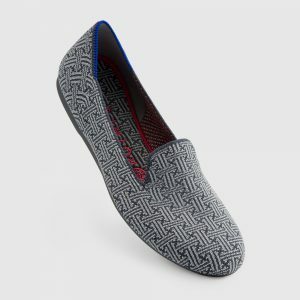 The super popular TOMS Women’s Classic Slip-On is excellent for a quick on and off style that you can wear for a lot of different types of activities. It isn’t a style you would get for walking long distances or if you are on your feet at work for extended periods, as they don’t have much in the way of arch support. When you first get them, they can feel a little small, but they generally stretch and mold to your feet the more you wear them. This style is easy to put on and simple enough that they will go with a wide variety of outfits. If you’re going to be wearing them without socks, it is generally recommended to go a half size smaller. Skechers have mastered the art of making a comfortable shoe. 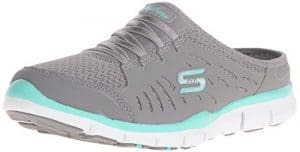 Not only are the Skechers Sport Women’s No Limits Slip-On Mule Sneaker super easy to get on and off, but they also look good and are relatively fashionable. This mule comes a triple-layered inner sole, that is the key features that makes it so soft and comfy. 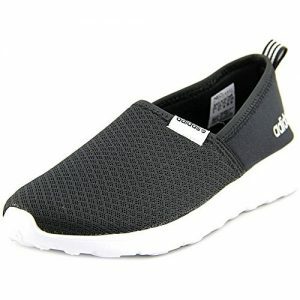 Also, this style is also an excellent option for those whose feet run a little hot, as they can keep your feet cool because of the Air Cooled Memory Foam, backless design and the partial mesh fabric used on the upper part of the shoe. The other feature that adds to the comfort level is they are incredibly lightweight. They are so light and comfortable that women who wear them often described the experience as feeling like walking on clouds. If you love Skechers comfort, but don’t love the open back style of the No-Limits design listed above, they also have their best selling Performance Women’s Go Walk Slip-On. It is a very popular shoe for people who have health concerns like plantar fasciitis, arthritis, or knee issues. This design works well for health issues because it is light, flexible and also has a little bit of stretch to it if you are experiencing swelling. They are easy to get off and on, and you don’t have to worry about tripping or slipping out of them, which can be a concern if you go for a mule style. They have good arch support and contain the Skechers super comfortable memory foam. The other great thing about this shoe is that it is washable, which is essential if you wear the shoe without socks and run into issues with odor. It isn’t the most fashionable shoe, but it does come in a nice variety of colors and patterns so you can coordinate them with your clothes. The only downside to this style is that the sole can wear down quickly. Rothys are one of the more buzzed-about casual shoe brands over the last few months after Megan Markle wore a pair of their flats. They are an exciting eco brand that uses recycled water bottles to make the upper part of their shoes. While shoes made out of recycled water bottles may not sound all that comfortable, they have an excellent reputation for comfort, and they are pretty stylish to boot. If you would prefer a harder, more molded shoe that is still comfortable the Easy Spirit Women’s Traveltime Mule is quite a popular option. It has more support than other styles that we have listed in this post, but it is still super comfortable and effortless to get on, especially if you have trouble bending to tie laces. They are backless, but they have a small lip that holds in your foot in the back, preventing your heel from slipping The arch support is good, and if you need to put in your custom orthotics, it is easy to do as it has a removable insert. The Traveltime Mule comes in a wide range of color combos and options (25 I think), as well as different fabrics and patterns. You can also get them in different widths. 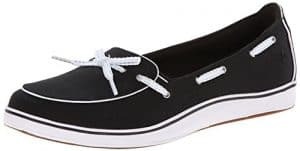 The Keds Women’s Chillax Washed Laceless Slip-On Sneaker is a very casual and relaxed shoe, it works well for women with narrow feet who don’t have any particular foot problems where they might need a lot of support. These shoes are comfortable, but they have almost no support inside. They do, however, come in a lot of colors and are very cute. They are easy to travel with because you can squish them up and throw them in your suitcase. They are light, attractive and washable and make a good, inexpensive, easy to wear shoe for the summer. Adidas NEO Women’s Lite Racer is made with a memory foam that is light and airy. Like many other options on this list, they have almost no break-in period, which means they are comfortable right from the get-go. They are also very breathable since they have the mesh upper fabric, so your feet shouldn’t sweat, even while wearing no socks. This Adidas styles cannot be washed, so you may want to keep that in mind if you have trouble with foot odor. Some women find this style to be comfortable for wearing for long periods and if you have to do a lot of walking. This style would make a great travel shoe since it is easy to get off while going through security, and your feet won’t overheat in hot weather. The Grasshoppers Women’s Windham is a comfy shoe that has a little bit of a different style than others on our list. The insoles are very soft and provide some arch support; they can also be removed if you prefer to add your own inserts. This boat shoe style can be worn with shorts, casual skirts, and jeans. The inside of the shoe has been designed to wick moisture away and is antimicrobial, so you can wear the Windham without worrying about odor. If you have wide feet, this shoe probably wouldn’t be a good choice, but they do come in regular and narrow widths. The Merrell Women’s Encore Breeze 3 is one of the more sporty looking slip-on available. Even though this shoe looks like it has a mesh fabric upper, it is just covering of solid fabric. Some people find this shoe to be quite warm, while others say they are breathable and great for the summer. They have a solid feel to them with a moderately heavy sole (compared to other options on this list). The Encore has a moderate amount of arch support so they can be worn for walking or standing for long periods. They are reasonably easy to get into without having to pull on, and won’t slide off easily like other mule styles. It’s hard to do a post on comfortable shoes without including at least one pair of Clarks. 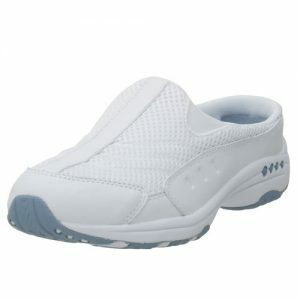 Clark’s Cloudsteppers are a very popular walking shoe that comes in a slip-on style that many women love. They are made of a soft leather upper that can work well if you need a comfortable, yet a professional looking style that would work in an office environment. They aren’t the most stylish shoe going, but they are very light, and a lot of people who have foot issue or joint pain swear by these shoes to help get them through the day with a minimal amount of pain. Colors- Most of the shoes on our list come in a decent variety of colors. The Ked’s, Easy Spirit and Tom’s probably have the most colors to choose from if you are looking for something a little different. Removable Insoles – If you wear custom orthotics or need to add an insert for arch support, make sure you get a design that has a removable insole. Can they be washed? Since many women like to wear their mule styles without socks, it can lead to an odor that can be difficult to get rid of without washing the shoe. Some of the shoes on our list that can be washed are the Keds, the Champions and the Skechers. Sizing – Sizing varies a little bit across the different brands. If you need a narrow or wide width, you may be a bit more limited in what is available. If you order online make sure you check reviews to see if reviewers give any advice on whether the shoe runs big or small. Arch support- Generally you aren’t going to get much arch support in a slip on shoe, although there are a few exceptions. The Easy Spirit, Merrell, and the Clarks are good options if you are looking for arch support. Style -Some of the styles of mule are very stylish and fashionable, and some not so much. If you are purely looking for comfort, you may have to sacrifice some style. Price– Like all shoes, the price range varies considerably for different types of comfortable shoes. The cheapest options are the Keds or the Champions, and the most expensive are probably the Clarks. Slip Resistant– Slip-ons can be extremely convenient and comfortable to wear, but they can also come with their own issues that some people might not consider. If the person who is wearing the shoe has limited mobility and is prone to slipping, you may want to ensure that any shoe that is bought is slip resistant and has a back, even if it is just a small lip to prevent slipping out of the shoe. Socks or no socks– Before buying you should consider whether you will be wearing the shoe with socks or not. If you are not planning on wearing socks, some people recommend sizing down half a size, although this depends on the shoe and you should check any sizing charts that are put out by the manufacturer. Are they easy to get on and off -Many people turn to mules due to health or physical issues that make bending down to tie up laces very difficult. Not all slips on will work well for women who have difficulty bending over. If the shoe has a back, you will probably still have to bend over to adjust the shoe. Mule styles with a minimal lip at the back are the best if you have any issues with bending over.